Are you looking for a solution to organize all your notes? One day when I was trying to open up Microsoft PowerPoint, I accidentally clicked on a strange purple icon with a white “N” on it. After clicking around and trying to teach myself what this strange purple icon did, I immediately looked up online to try to figure out what this Microsoft icon was used for. I figured out that this strange purple icon was actually called OneNote and is used to create digital notebooks. At that moment back years ago, I did not know what I just stumbled on accidentally would impact my life so much. I know it seems quite dramatic, but it’s true. I have found that using this purple icon is very useful for me in my life. I have especially found that OneNote is very useful for me being a college student. I can have every single notebook I would normally have in paper form in my computer. For example, I had different notebooks in OneNote for each class I was taking. Within each notebook, I was able to organize my notes to the maximum, which I am so grateful for. I think the more organized something is the better, and am very glad that OneNote keeps me organized. OneNote actually helped me cut down my study time, because it is searchable. I no longer have to search and search through my paper notebooks for a specific topic, I can find it instantly just by searching the notebook. OneNote is broken up by Notebooks just like you can go to the store and buy a paper, spiral bound notebook at the store. It is further broken up into Sections, and each section can have separate Pages. But unlike a paper notebook, OneNote has many amazing features that just aren’t possible with pen and paper. OneNote allows you to insert many types of information including text, pictures, spreadsheets, audio, and video. These images that you insert can be from your own device, from online pictures, or could be a Screen Clipping. Screen Clipping is a great way to capture anything on your computer as you see it. For example, you can Screen Clip a website homepage just by bringing the homepage up on your computer, and then going to Insert then Screen Clipping in OneNote. I have found that this feature is helpful when I want to insert graphs and charts from my professor’s notes. If you ever need to figure out a quick math calculation, there is no need to go and find a calculator or your calculator app. OneNote has a great feature that lets you do a math right in your notes. Simply type out your equation, followed by an equal sign (=) and you will see OneNote calculate the results of your equation instantly. For example if I wanted to figure out the math problem (83×54)+(23×61)=5,885 , I would just press the equal sign at the end of the equation then hit the spacebar and the answer would pop up instantly. OneNote offers a unique ability to share a notebook with multiple individuals. This is especially useful for you to use in your business. Just like Google Drive, OneNote gives its users the ability to work on your notebooks with others on a network or over the Internet. This will be extremely beneficial for group work. You can easily create tables in OneNote as well simply by entering in your first word of the table and hitting the “Tab” key. You can tab over to create new columns and press enter to create rows. You can also insert a table by going to the Insert tab a then to Table. However, if you already have an excel spreadsheet that you would like to utilize, no problem! OneNote lets you insert an existing spreadsheet or create a new spreadsheet in OneNote. Then, you can edit the spreadsheet all within your notes. By utilizing the many templates OneNote has to offer, you can customize your notes to your preferences. OneNote originally comes with a white background or ‘paper’ as OneNote calls it. If you click on Insert then on Page Templates, you will see all the options for a customized templates that OneNote offers within the categories of Academic, Blank, Business, Decorative, and Planners. If your device has touchscreen capabilities, you are able to insert your handwritten notes, just by utilizing your finger. With 52 different colors and 9 different types of thicknesses, you can customize your notes to fit your needs. OneNote even has a feature where you can change your drawings or Ink into text or into math. All you need to use your own handwriting in your notes can be found in the Draw tab of OneNote. Every part of your Notebook can be easily moved to a new location in your Notebook. You can cut bits and pieces and put them together all customized to how you want them organized. Then if you change your mind, you can reorganize to however you would like. Whether you use OneNote for home, school or work, you can customize your notes however you like. Capture your random thoughts, ideas and let OneNote be the home for your to-do lists. This purple icon lets you find all your notes quickly in the recent view. OneNote has created many ways for people to access their notes. The purple icon can be accessed through not only Microsoft devices but all across the board. You are easily able to get every note on every device. Another benefit to this purple icon is that it’s very eco-friendly. With creating your notebooks in OneNote, you can save 70 pages of notebook paper that would be used in a normal notebook. By using OneNote, you are saving paper, which saves trees while making your life easier by creating a searchable notebook online that automatically saves, is customized to you, and lets you gather and share information. I hope you accidently or purposefully stumble upon the little purple icon sometime in the future too. 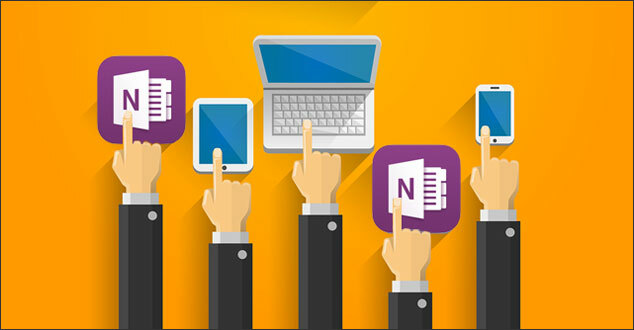 Download OneNote for all your devices to make your life easier all around. To learn how to put OneNote on each device that you have, go to www.onenote.com. Start using OneNote in your business to help you and your coworkers stay organized and stay on the right track with one set of notes. Have you used OneNote? If you have, I would love to hear your thoughts about it in the comments below. If you haven’t used it, do you think you might give it a try? I am not being or is R & R Web Design LLC compensated for this product review about OneNote. In addition, I am not, nor is R & R Web Design LLC, an affiliate in any form.